Ok, so maybe you won't have 20 boxes of items sitting around, but you may have 20 boxes of things to go through in your cupboards! Depending on who was in your room before you, there may be a treasure trove of items to find. 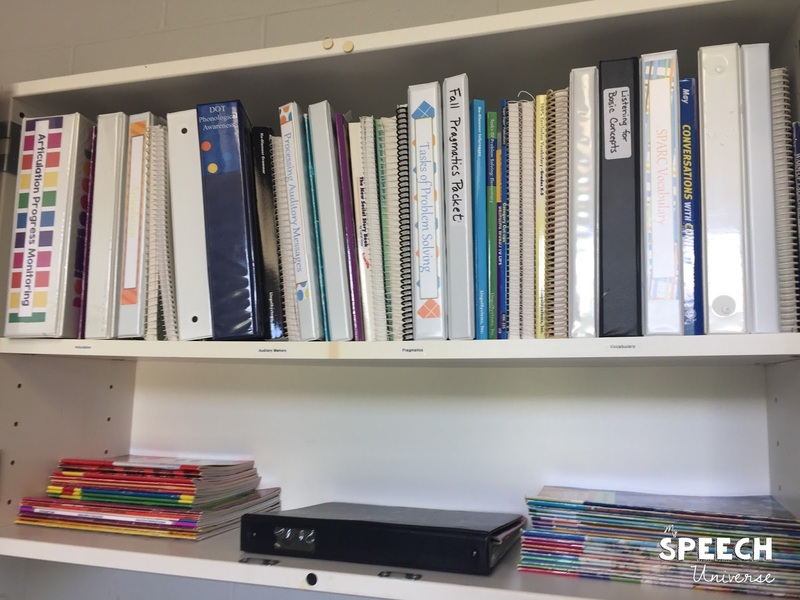 I inherited my first speech room from an SLP who was there for over 30 years. 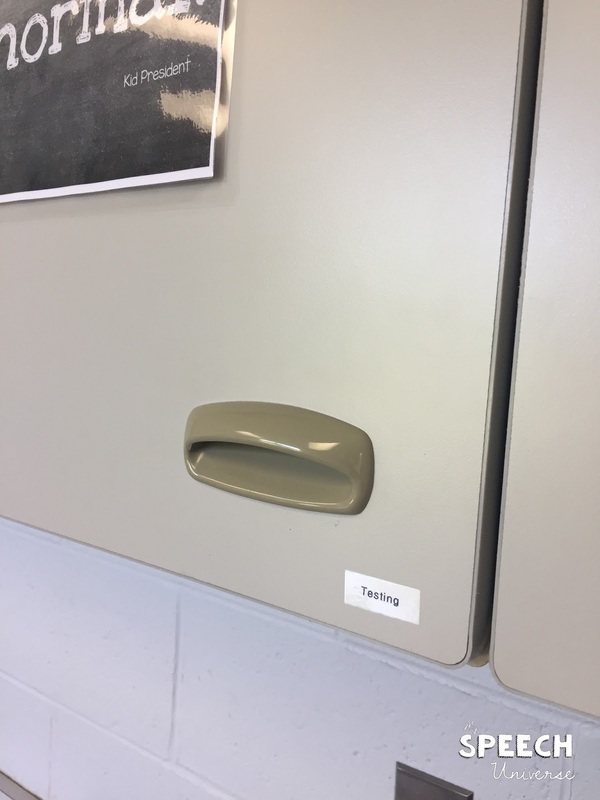 At the same school. 30 years! Needless to say, she had a LOT of materials that she didn't take with her when she retired. Some of these items were great, while some left something to be desired. I didn't really need a set of dittos (you know, the purple looking mimeographed papers) from 1975. I'm not saying that something from that time frame might not be useable, but the pictures are sometimes really hard to decipher for my students, and sometimes inappropriate too. 1) Sort materials. Go through your cabinets, bookshelves, boxes, etc. and make piles of items. I like to organize by topic. Put all of your articulation items in a pile. WH question materials in another pile. Vocabulary items in another pile. You get the picture. It will take some time, but trust me, you will appreciate it later. 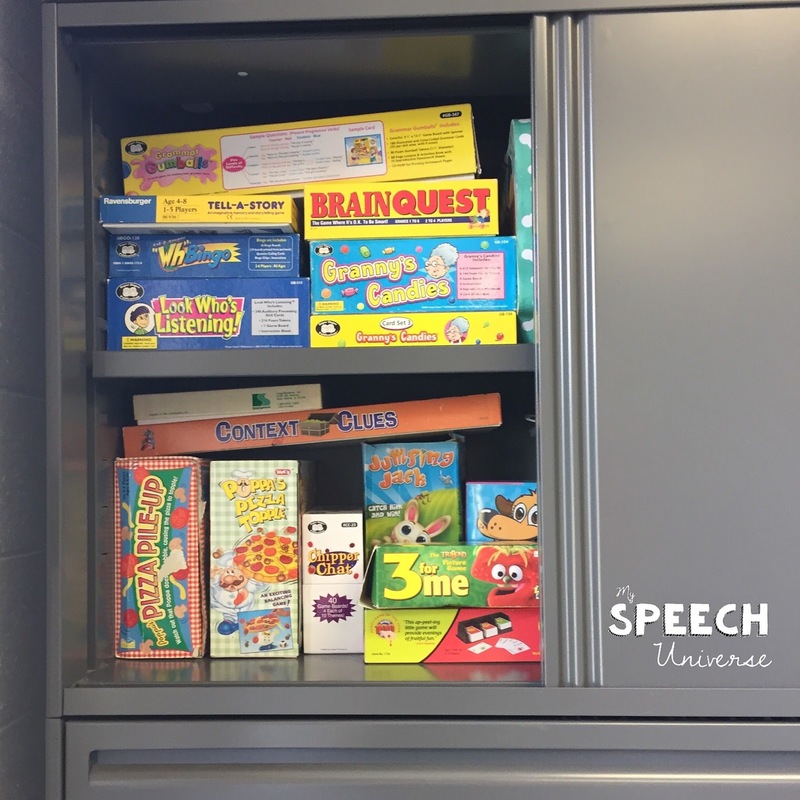 This will not only organize you, but you will get a better picture of what is actually in your new speech room. 2) Purge. (a bit) What I mean by this is go through and throw away those old dittos that you know you will never use. 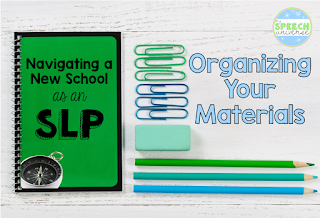 As a new SLP, I wouldn't throw away all materials though. Just because it is old doesn't mean it may not be of use to you. If you question whether you may use something. Keep it. Next year you can do this again and get rid of anything you truly never touched. 3) Make a donate box. Sometimes when I am going through my items I find duplicates of things that I either already have or things that there are just duplicates of. 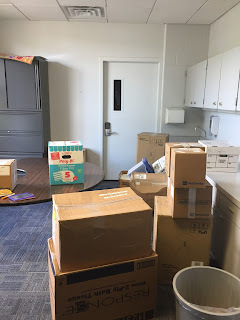 I put these items in a box to share with my fellow SLPs in my department. 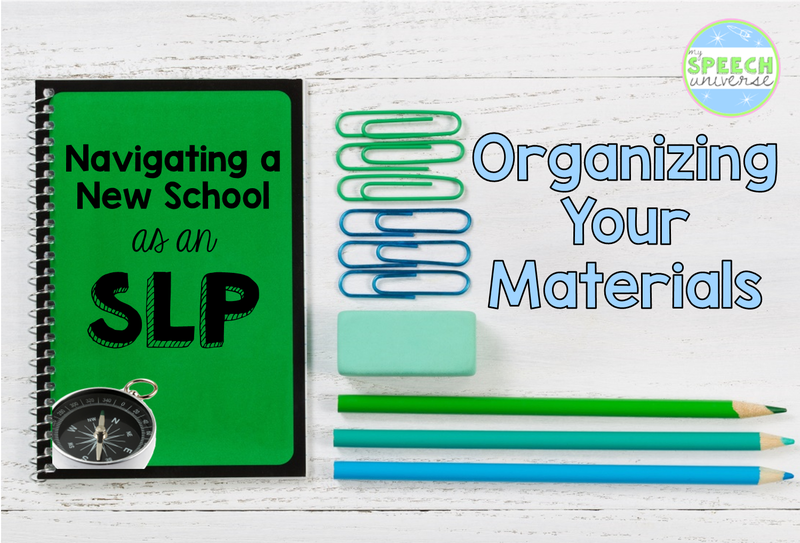 You could also try to share with any SLP groups you are a part of. Make sure you have permission from your district if you are trying to sell any materials. If you sell the items you could use the money to purchase new therapy materials. Again, just make sure you have permission to do this, it may be district property. 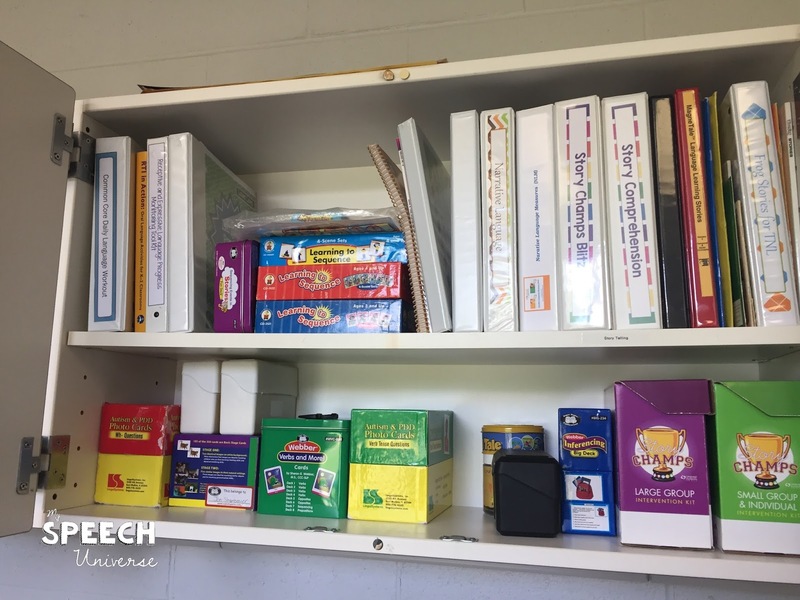 4) Organize materials on your shelves. 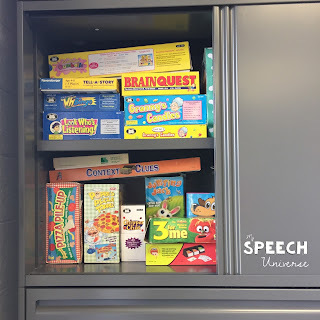 Now you are at a place where you can take all of those lovely piles of therapy materials and place them on your shelves, in cabinets, drawers, or pretty much wherever you can find a spot. I like to label my cabinets with my trusty label maker when I move to a new place just so I can find everything easily. I organize my shelves by topic. 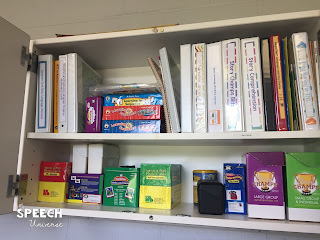 Now that I have organized my items on the tables, all I have to do is place them on the shelves and label the category. I like to keep all of my games handy. This year I used the top of a file cabinet next to my kidney shaped table to house all of my games. This makes them easy to reach when I am pulling materials. I also like to keep all of my articulation cards close at hand. Unfortunately, when I moved in, I wasn't really left with a lot of those. I left all of my old cards at my last office because they were purchased for that particular school. I loved those cards, and I'll have to replace them soon. Now you should have all of your materials in place, and you can move on to figuring out your caseload. I'll help you navigate that next week.